Today, January 27th is designated by the United Nations as Holocaust Memorial Day. It is the anniversary of the liberation of the Auschwitz death camp and an annual International Day of Commemoration in memory of the victims of the Holocaust. The UN General Assembly resolution creating Holocaust Memorial Day also said the United Nations “Rejects any denial of the Holocaust as an historical event, either in full or part”. On Holocaust Memorial Day in 2015 we published a briefing looking at Holocaust denial in social media and the way it is continues to be use to incite hatred and violence against Jews today. After removing many antisemitism comments posted in reply, most of them on Holocaust Memorial Day itself, we published a briefing on “Modern Antisemitism”, a concept presented by French philosopher Bernard-Henri Lévy when he addressed the United Nations General Assembly. Modern Antisemitism combines antisemitic anti-Zionism, Holocaust denial and the argument that the Holocaust is being used to silence discussions on other genocides. For a detailed look at this topic, please see the briefing. On Holocaust Memorial Day in 2016 we released “Measuring the Hate: The State of Antisemitism in Social Media” a major international report into antisemitism in social media. The report for the first time looked at the relative levels of antisemitism across social media platforms and how effective the social media companies were in removing it. The answers were not reassuring. 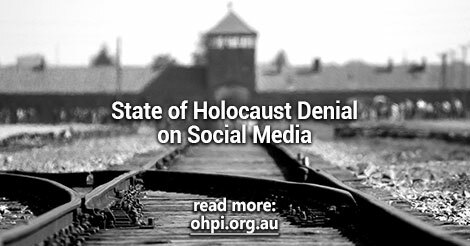 To highlight the relevance of this report on Holocaust Memorial Day, a press release focused outlined the state of Holocaust denial on social media based on the reports data. The next day we again received a barrage of antisemitic abuse and Holocaust denial over social media, as well as other content promoting hate against Muslims. We documented these unbelievable responses in a follow-up briefing. While more of the past examples of Holocaust Denial we have been monitoring are being removed (after being online for years) new Holocaust denial content is constantly being added. Through our FightAgainstHate.com reporting tool we currently have 185 examples reported from YouTube, 68 from Facebook and 94 from Twitter for a total of 347 items. Some of these items are no longer online after being removed by the platforms, but many others remain. 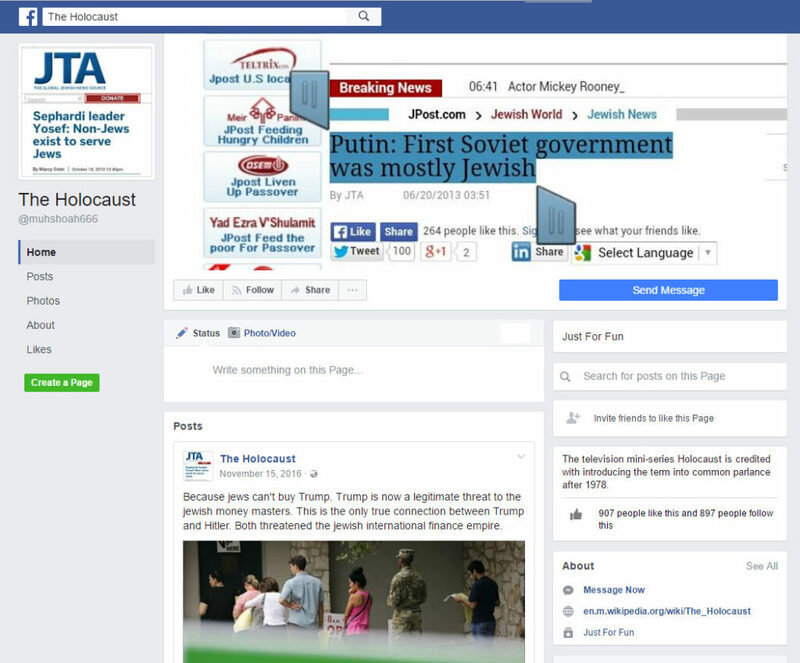 If you know of examples of Holocaust denial, please report them first to the platform and then to FightAgainstHate.com so we can continue to monitor the situation. With Germany in particular and the European Union more broadly reaching agreement with social media companies last year on better moderation of their platforms in compliance with local laws around hate speech and Holocaust denial, we expect the platforms will be getting better at identifying and removing Holocaust denial and other forms of hate speech during 2017. On the other hand, much of the Holocaust denial comes from the far-right and online from the alt-right who are now emboldened following the election in the United States. So while more hate may be taken down, the rate at which is is being posted is likely to be far high, especially for Holocaust denial, and we expect the overall volumes of Holocaust denial will actually increase this year unless new approaches are adopted to tackle this problem and they are properly and significantly funded. We will continue to do what we can, and specifically we will continue to keep FightAgainstHate.com operating as long as we can, but given there are just 15 people funding us through small monthly donations (typically $10 a month) and the one off donations we have received total less than $5000 for the year, what we can do without additional support is pretty limited. While the problem has grown worse and will continue to get worse through 2017, our resources to fight this problem have dropped from an organisation with 5 full time staff to an organisation with no staff. Anyone wishing to become the 16th regular donor, or to make a one off donation, to support our work tackling the rising problem of online hate can find details here. For everyone else, please help us in our efforts to tackle Holocaust denial, and online hate more generally. If the content is in a safe space (i.e. not in a space dedicated to hate) and you feel comfortable doing so, challenge it or support others who are challenging it by liking their comments. Report the content to the social media platforms. Report it to FightAgainstHate.com so we can track how they respond. To get you started, here’s a few items that have been up far too long and need reporting and removal by the platform providers. These examples are all part of the initial sample of over 2000 items we have continued to monitor since 2015. With your help hopefully at least these 6 examples will now be removed. 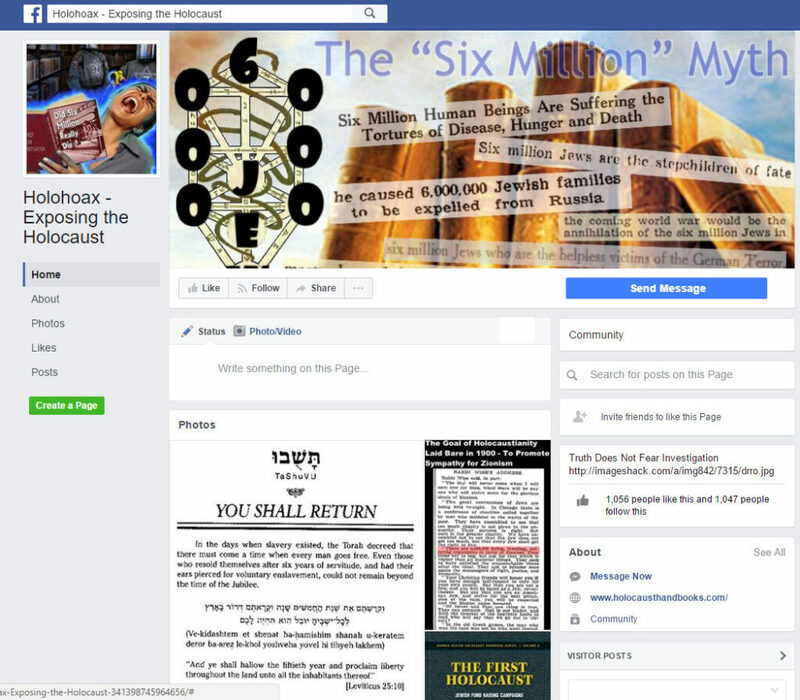 The page “Holohoax – Exposing the Holocaust” (ID: 341398745964656) actively promotes Holocaust denial. 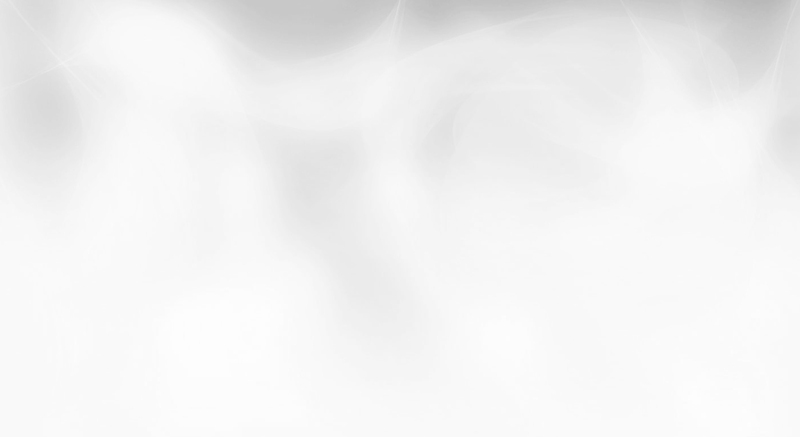 The page has 1,056 fans, 10 of them having joined in the last week. This is despite making no new posts since January 2014. This page needs to be cleaned up and removed by Facebook. Visit the page and report it, then report it to FightAgainstHate.com so we know ho many people have reported it to Facebook. This account on Twitter made multiple Holocaust denial tweets. This one promotes the false narrative of the Auschwitz death camp being some kind of holiday camp. See it here and report it, then report it to FightAgainstHate. 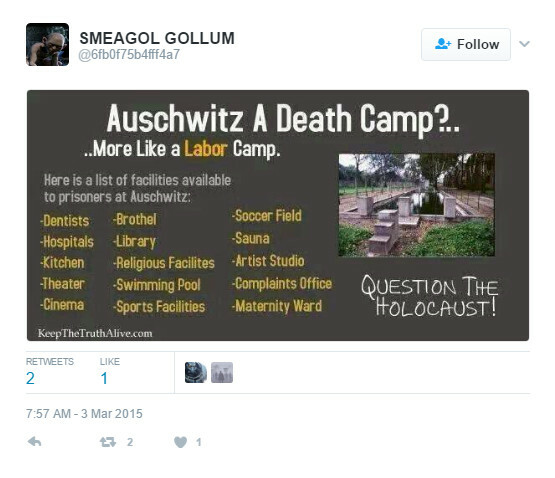 This user also posted a number of other Holocaust denial posts. This tweet is from an account focused on 9/11 conspiracy theories. 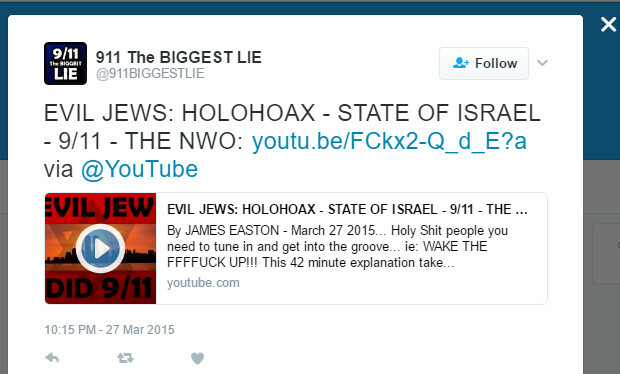 It incites hate against Jews and claims the Holocaust is a conspiracy theory. See it here and report it, then report it to FightAgainstHate. 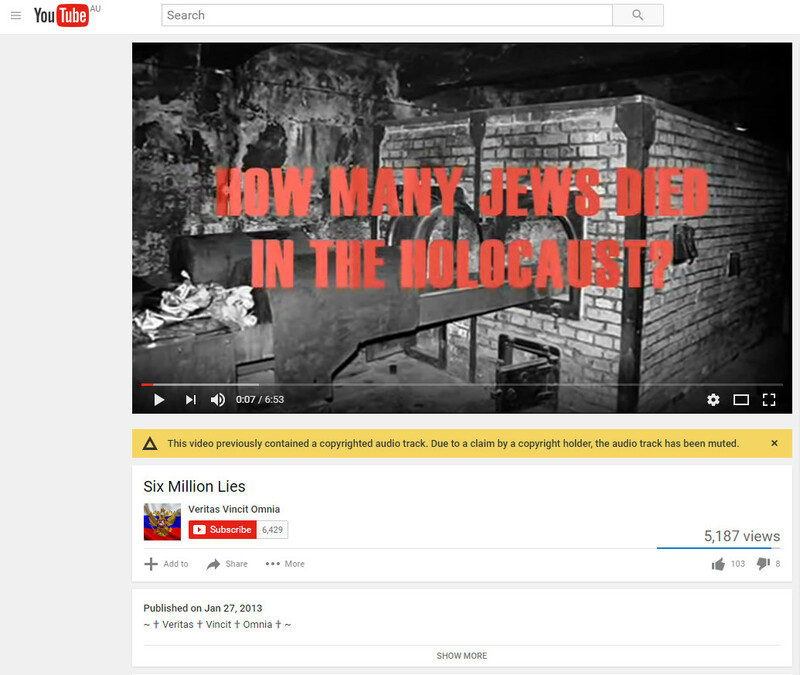 This YouTube video promotes Holocaust denial by focusing on the figure of 6 million Jews who died at the hands of Nazis. This is something often done by Holocaust deniers. The 6 million figure is not exact, but is an estimate originally made by the Nazis. An article at Haaretz explored the research into the number who have died by various scholars, numerous accounts repeatedly arrive at a figure of around 5 to 6 million. See the video here and report it, then report it to FightAgainstHate. 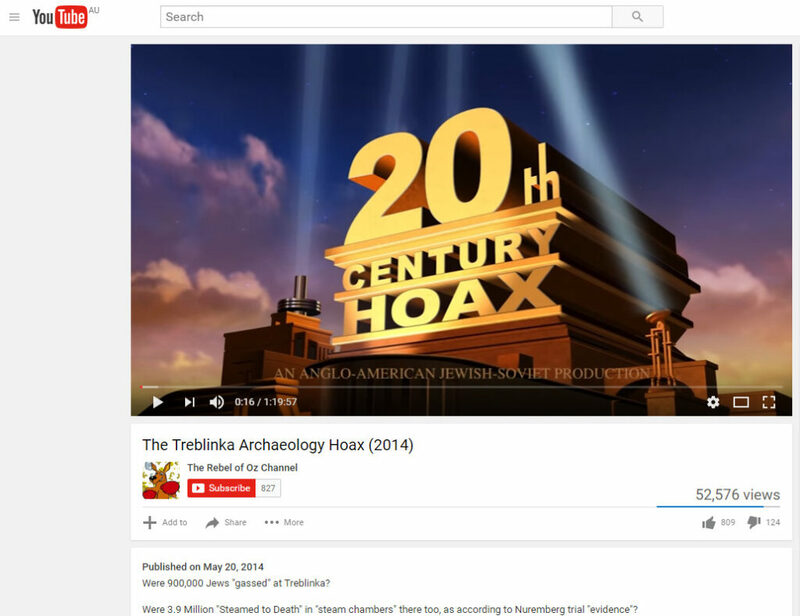 The last example we include in this briefing is a professional looking documentary promoting Holocaust denial. It’s posted from an account claiming to be Australian. See the video here and report it, then report it to FightAgainstHate. You can also help us spread the word by sharing this post (if you haven’t yet done so). If you would like to support our continued work tackling Holocaust denial and other forms of hate, please donate here.